The World in 2050. 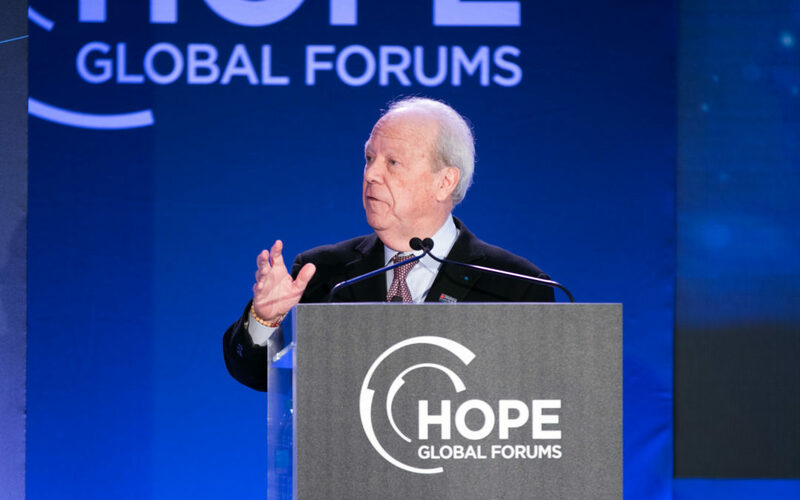 A Journey Around the World in 18 Stops | HOPE Global Forums | Presented by Operation HOPE, Inc.
What is the world telling us? I have been part of a think tank for a few years based in Geneva, The Monthly Barometer and I will share with you what we think of the world today. So, let’s travel around the World not in 80 days but in 18 Minutes. Not the world today…. But in 30 years! Some preliminary remarks before we get there. Today’s world is complex, turbulent, volatile, unpredictable, and, in many ways, unreadable, but … still a great world! The headlines have never been worse. But, (an increasingly influential group of thinkers insists that) humankind has never had it so good – and only our pessimism is holding us back. In fact, the media shapes our views about violence and some worrying trends: the danger of pessimism becoming a self- fulfilling prophecy. This being said, how about the future? Should we assume that the situation will continue to improve, or will a catastrophe befall us at any moment? Hopefully you will be able to make your own judgment after our journey. Such a journey could be approached in a number of different ways: Geographically (by country or zone); thematically (economic issues, geopolitical, societal, environmental, technological, etc.). However, when we travel, especially around the world, the shortest distance between two points is not necessarily a straight line, but a meandering one. For this reason, you will pardon me if this short journey is sometimes confusing. I will be taking unexpected detours and convoluted routes that overlap in unpredictable ways. I may even take some short cuts. But, I will try to avoid dead ends! Today’s world is dominated by six forces that are in constant interaction, triggering feedback loops and domino effects. The Gutenberg millennium was the kingdom of the left-hand side of the brain, of reason and logic. In the new millennium, the right-hand side of the brain will prevail, together with intuition, paradox and freedom. The consumer society is becoming the information society, our mass society is shifting towards a society of individuals, and our standardized society is moving toward a hybrid society. A world of total transparency. We are now living in a “post-Snowden” – “post WikiLeaks” world. We would like to believe that this is not the case, but the notions of privacy and confidentiality have disappeared, or are in the process of doing so. A world in mid-stream: we are living in a world that is in the midst of a great transformation, and we have no doubt reached an inflection point. We are on the verge of a new era whose characteristics are unknown, or poorly known. We have a remarkable central tension underway – on the one side, a very positive trend, huge innovation and technological advancement, and on the other hand, rapid social change and transformation. And this tension is occurring within a complex environment, where many of our traditional structures and assumptions are eroding. We live in a high-velocity world, the result, primarily, of the widespread use of new technologies. There is a general sense that everything is moving faster and faster, that things are sometimes getting away from us. is constantly affecting and exacerbating every other factor and risk. Global growth worldwide has accelerated (+35%) in the 10 years before the crisis. But, Despite globalization taking 2bn people out of poverty, nearly 3 billion people worldwide continue to live in poverty, subsisting on less than $2.50 a day. In the United States alone, 45 million citizens, or 1 in every 6 people, are considered living below the poverty line. (9 Million have no income). Additionally, 75% of Americans are living paycheck-to-paycheck, with little to no savings. Despite growth, income disparities are widening – inequality is growing … even more since the last crisis in 2008. The welfare state and income redistribution in Europe – may be challenged and so is the Chinese model of an economy built on export-led growth with an undervalued currency. The new challenge: A western world with less growth than in the past and in the grip of “deflationary” forces. And, productivity is declining: A Gallup study, published in partnership with the U.S. Council on Competitiveness, finds that the problems go back sometime. And three large sectors bear primary responsibility for the malaise: healthcare, housing and education. The combination of a declining productivity, too much debt, and too little growth is pushing countries into a classic debt trap. As a result, political volatility will prevail. The planetary boundaries are being challenged, with uncertain consequences. Key security alliances constructed in the aftermath of WWII are becoming less relevant and flawed by severe structural inadequacies. The authority of the pillars of the global architecture, Bretton Wood institutions, WTO, NATO and even the United Nations, etc. are not as effective as they use to be, nor are those institutions sufficiently representative today. G7, G20 is an attempt to cope, but not much better. We have inherited from the time when we lived off the land and industry, a mindset and systems now outdated. Unlike Earth, divisible and controllable science and technology in a global world are not. This is what makes those organizations based on borders obsolete. The notion of borders is blurred today. The convergence of emerging nations and developed ones will no doubt not take place. So, what about the western world? What about the dominant Western ideas? My friend Chandran Nair the founder of the Institute of the future, looks beyond the G-20 consensus about globalization and expresses deep doubts that the dominant Western ideas of the past 100 years are much of a guide for the future. This will put huge pressure on resources, the most formidable challenge of all times face us, from food scarcity, to immigration. Technology is going to change everything. This is, obviously, not an earth-shattering observation, but it is an absolute certainty whose consequences and applications we continue, in my opinion, to underestimate. This is “The Third Wave” : the era when the Internet stops belonging to Internet companies. It is the era in which products will require the Internet, even if the Internet doesn’t define them. It is the era when the term “Internet-enabled” will start to sound as ludicrous as the term “electricity- enabled,” as if either were notable differentiators. Let me add a personal note: Most leaders today are good leaders, but they live in a word which does not exist anymore. The transatlantic partnership we have seen in the last 100 years is also challenged. America’s interests in Asia are rising while its interests in Europe are declining. Europe and the United States are parting on a number of structural and key issues, not because of people, but because their strategic interests start diverging. From Mediterranean Sea, until the 18th century, to the Atlantic in the 19th century, then a declining Britain and a rising America 150 years ago to a rising China now: center of gravity has moved to the Pacific. But, the geopolitical landscape of Asia Pacific is changing dramatically: the new Silk Road Chinese project and the current US administration views on China and Asia and may reverse this trend. China is boldly striding ahead. Not only it has revived the ancient Silk Road as “the next phase of globalization, but it has also proactively set its sights on conquering the latest artificial intelligence technology, taken the lead on climate change and shaping the next world order in its image. So, in 2050, will “The Pacific” or China or the US shape the world? The role of innovation (techno-optimists versus techno- pessimists). We can no longer extrapolate from the past to understand what lays ahead, but must experience it and adapt as it happens. We can no longer plan, we can only prepare: The World of Bits will Invade the World of Atoms and you will have to learn how to collaborate with Machines. Nobody can really predict how many jobs robots and artificial intelligence may destroy. Robot are going to take our jobs. The experts believe all jobs would be fully automated in the next 120 years, and that there is a 50% chance of AI outperforming humans in all tasks in 45 years – known as high-level machine intelligence, or HLMI. So… Others think that Governments, employers and educators should be urged to equip people with the skills they will need to work alongside robots, rather than compete with them in the future workplace. The fundamental design pattern of success with technology is to enable people to do things that were previously impossible. Companies that only use technology to do less by getting rid of people will be surpassed by those who use it to help them to do more and better. The origins of the next crisis. Where will it arise? Too much funds and Overliquidity? Sunnites/Chiites? Debt and or bond crisis? Etc. The core of the crisis of representative democracy is due to a widening gap between people’s aspirations and the capacity of political institutions to respond to the demands of society. Fernando Henrique Cardoso (ex-president of Brazil): “It is one of the ironies of our age that this deficit of trust in political institutions coexists with the rise of citizens capable of making the choices that shape their lives and influence the future of their societies”. The skyrocketing cost of chronic diseases ($47 trillion worldwide over the next 20 years, or 30% of GDP), and a world aging like never before (800 million people now over 60): wellness should no longer be optional. More governments will take legislative action to require or reward healthier behavior. When are we going to move from Optional to Mandatory wellness? And when will the World be ready for Gross National Happiness? There is a positive correlation between how entrepreneurial a society is and its national level of happiness. Research clearly shows that countries that score well in terms of Global Entrepreneurship Development Index (GEDI) also score well in terms of happiness. Also, since 2008, Gallup and Healthways have partnered to understand the well-being of populations. The Gallup- Healthways Well-Being Index®, takes the concept of quantifying well-being at an individual level and expands it to include communities, states and nations. So, knowing all of this….. Are you ready?? It is hard to comprehend the world, but we can still act on it and have an influence. This happens thru collaboration. Almost always great new ideas don’t emerge from within a single person or function, but at the intersection of functions or people that have never met before. And them altogether are siloed, academics, politicians, economic and social leaders. When academics, economic and social leaders, entrepreneurs and Politicians connect, get together and collaborate, they fuel change. And, there is no collaboration without connection.